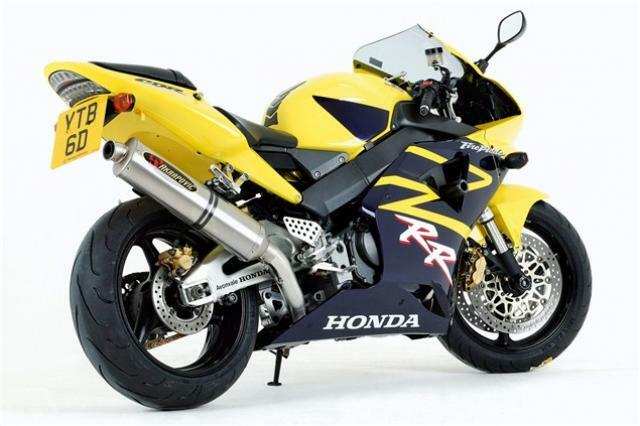 The Honda FireBlade is a modern icon in sports motorcycling and has a special place in the hearts of British headbangers. Launched in 1992, it revolutionized the ‘superbike’ and set a benchmark that took the competition several years to reach. The RR model was launched in 2000 with a 929ccc motor, updated less than two years later with a 954cc motor. Here’s the received wisdom on 21st Century ’Blades. Generally very good and long lasting. Older models will need checking for sludgy fork oil and the like, but the ’Blade has had pretty good quality suspension components as standard. Early models didn’t have a mudguard shroud over the fork tubes and therefore suffer from stone-chips/pitting. One thing to bear in mind with the ’Blade models we’re concentrating on is the fork recall (see later). A number of owners worry about this, but it can be pretty common. Both the 929 and the 954 have been reported to be clattery on a cold start. If the bike makes a noise, check to see which side of the engine the noise comes from and whether it ceases when the clutch is pulled in. If the noise continues with the clutch in, then take it to a dealer as it may need tappet adjustment. Maybe an oil change is needed, too? When was this last done? Even with the 2000-2003 bike being down on cubes compared to the opposition, the FireBlade cannot be accused of being down on real-world power. What it does have it uses well for the road. One negative point here is the fact that some machines – both feel at low rpm, while others have a strange ‘buzziness’ at 5-7000rpm. Don’t worry if the bike is on its sidestand and you can’t see any oil in the sightglass. Many owners have been scared of seeing NO oil in the sightglass when warming the bike up on the sidestand. Those who are mechanically sympathetic will only warm the bike up while the machine is on the level with the rider on it and the stand up. If the bike is on it’s sidestand, after fi ve mins the oil level should rise into the window. Lots of worried owners may plump for fully synth, but most owners stick with semi-synth, as long as its a decent, ‘well-known’ brand. Not as splattered with shite as the Chav’s favourite the GSX-R series, but still a target for tat. Avoid anything that looks like a tart’s handbag. End-cans are fine if the original comes with it, and check whether fuel-injection has been altered to suit. Huggers are good, as are tank/frame protectors. A number of owners have complained about this. Anything between 2-7000rpm and the bars & pegs buzz bad enough to give the rider pins & needles or numb hands. Owners say this can be traced to loose bolts in the engine or exhaust or if an injector needs adjusting. Bridgestones were fave on the first machines, as they were designed especially for the bike. On later machines Pirelli Diablos abound, as do the Bridgestone 014s. Early ’Blade owners also have a penchant for Michelin and Metzeler rubber. Many owners drop a tooth on the rear or go up two on the back for better acceleration. It’s a trick used by the current 2006 model. Yes, for some reason Honda have blessed Y2K and on machines with long hero blobs, so be warned. These aren’t as early to touch down as the SP-1 and SP-2, but try not to be disconcerted by the sound of metal on Tarmac. Remove if need be on track days. Pretty good on these fuel-injected machines. Expect around 120-140 before reserve unless on a track when around 80-90 is more likely, like. Generally hard-wearing and adjustable, but after around 30,000 miles plus, some may have had enough. By now, many early to mid-1990s ’Blades have knackered rear shocks. Generally very excellent! Some owners have small complaints, such as the shock body receiving some rust if neglected. Otherwise faultless. Generally excellent for all/both machines, but with the 954cc 2002-2003 machine being a particular fave and holding its value well, even against supposedly ‘superior’ GSX-R1000K3s. Read into that what you will.